If you’ve heard about the Harry Hall One Club but are still asking yourself why you should join, then check out our top 10 reasons to become a member! Here we tell you why joining One Club is the smartest choice you’ll make this season! From being covered no matter what horse you ride to never waiting for a sale again, the One Club has it all. The rules of shopping are changing… as a Harry Hall One Club member, for £40 a year (or £3.33 a month) you can buy ANY of our brands with up to 30% off — all year round. And you'll always be given priortiy access to sales and events ahead of everyone else, giving you the best chance to score the best deals. We give you payment options. Introducing monthly payments means that for just £3.33 a month you can save on shopping and ride out safely every day. Or you can choose to pay the £40 annually and spend the rest of the year safe in the knowledge that your bank account and equestrian life are protected. Public liability insurance is as essential a part of your kit as your riding hat — yet tens of thousands of riders unwittingly don’t have it. If a horse you own causes an injury or accident - even one just turned out in a field — you could be liable. You need personal liability cover — and it comes as part of your One Club membership (See our One Club page for terms and conditions). 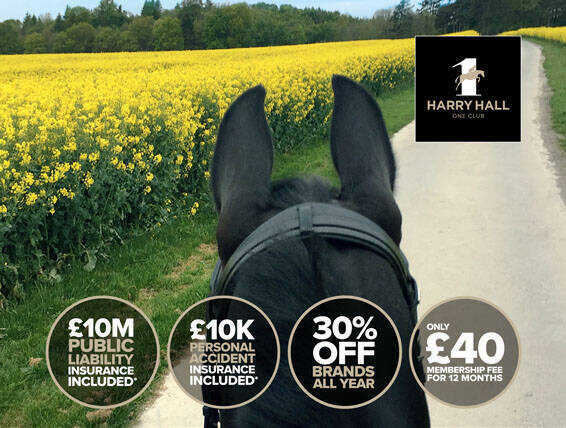 Harry Hall One Club’s public liability insurance covers you no matter what other horse you ride. One Club membership also provides up to £10,000 personal accident cover. And all of this for £40 a year. You need public liability cover to ride in certain places — the Forestry Commission, for one, urges riders to have this cover before riding on their land. Many livery yards also require clients to have this cover in place. Equine defence lawyers like Jacqui Fulton, who has done important work in the equestrian sector, are passionate advocates of public liability insurance. And as such, they fully support the Harry Hall One Club. Our insurance is organised and underwritten by well established names in insurance. Our package has been put together by SEIB and our underwriters include PEN and Royal Sun Alliance. Every time you shop, you give yourself the chance to win your basket back. At the end of every month we pick one random winner and give them the value of their shop back. The more you shop, the more chances you have to win! By the way, Harry Hall has a brilliant in-house customer service team in our Yorkshire offices. They are local, horse-savvy people who will happily advise you on fit or functionality if you have any queries. One Club members may also receive a quarterly newsletter packed with know-how, news, sneak peeks at new products and ranges in development, and exclusive invitations to attend brilliant free events like the Harry Hall yard Visit programme. You also receive 30% off our revolutionary Protechmasta range - exclusive to HarryHall.com One Club members.